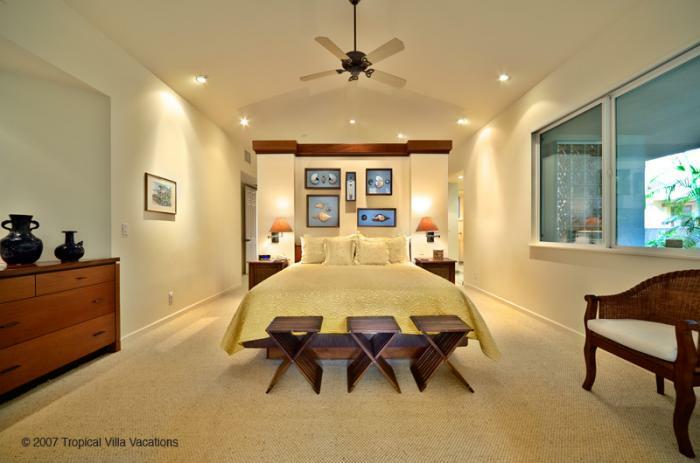 Sea Shells is a beautiful spacious family-friendly beach front vacation home with a heated lagoon pool, strong air conditioning, three bedrooms, and 5 bathrooms, all set directly on gorgeous award-winning sandy Ka`anapali Beach. This west facing home serves up glorious scarlet sunsets and dazzling moonsets along with some of the island's best whale watching during the winter season. Kaanapali Beach is perfect for long romantic walks, swimming, kayaking, snorkeling, sailing and scuba diving. Please click on the Testimonials link to read the many effusive and very position guest comments such as, "Dear Owner, Thank you so much for providing us with such a beautiful backdrop for our family vacation. We don't want to leave. In fact the men are out on the patio 10 minutes to departure cold drinks in hand, refusing to leave. It was so wonderful to feel we could just relax here at the house rather than spend our entire vacation running around looking for excursions. Everyone found peaceful corners in the house to find solitude and yet the rooms were large enough for the whole group to gather in. We loved the kitchen and I think we will all be sad to go home to our smaller and less fancy kitchens. Thank you for sharing your home with us. It was an absolute dream. Sincerely, The K's, the J's and the B family 06/07." "We are feeling very sad as we prepare to leave your little piece of paradise today. We are from Indiana where a water view consists of the Ohio River. We love your home. You thought of everything in the kitchen. We love to cook and spent a lot of time doing so with the help of your perfectly stocked facility. The pool area is gorgeous. We felt like we were swimming in a hidden lagoon. The great beach access made it easy for us to go our separate ways when in the mood. Thanks for the books, the Hawaiian bath products, the music, beach equipment, tiki torches, hammock, and on and on. Heaven on earth!! Jeff and Nancy, Evansville, IN and Jeremy NYC, 05/07". Just a few of the inclusive complimentary benefits provided are Personal Concierge Service, parking for multiple cars, high speed wireless internet access, local phone calls, mid-week housekeeping service, in-villa safe, fresh floral arrangements, tropical bath treats, and personalized in-villa greeting orientation. Unlike at many nearby hotels there are no extra "Resort Fees" charged! At Sea Shells, discerning guests will luxuriate in a contemporary styled and privacy gated home set on one acre of landscaped grounds with central air conditioning, a lagoon shaped free form heated swimming pool, outdoor hot tub spa, high speed wireless internet service, safe, office nook with computer and other office equipment and an exceptionally well equipped gourmet kitchen with all new cooking and dining supplies. Each of the 3 bedrooms has its own private en-suite bathroom and entertainment system. A convenient office nook provides a large desk, an imac computer ready for guest use, ethernet cable to hook into the high speed cable modem, office supply, fax, and brand new multi-function office machine. There are two laundry centers. Use of the garage is available. A hop and skip from Sea Shells is a beach front kiosk which rents ocean sports equipment including surf boards, boogie boards, skim boards, hobie cats and snorkel sets. During summer months jet skiis may be rented in front of the Hyatt Hotel. The charming Sugar Cane Train depot is within walking distance. A convenient beach front restaurant, Castaway, is adjacent to the kiosk serving breakfast, lunch and dinner in a casual beach front setting. The primary Kaanapali Resort hotels as well as Whaler's Village Shopping Center and its many restaurants featuring live music on the beach, can be reached within 1-2 minutes by car or on foot if you hike some distance down the beach through the Sheraton Kaanapali Resort, then along a paved pedestrian walking promenade that hugs the coastal beach. From the heart of Ka`anapali Beach hop on a sailing catamaran for a snorkel sail, scuba diving, or romantic sunset cocktail cruise. West Maui airport is minutes away for easy access from other islands. The recreational activities available within Kaanapali Resort are endless. Our very own exclusive in-house Concierge will assist you with all of your vacation planning needs, including adventure reservations, auto rentals, catered meals or private in-villa chef service, sailing, snorkeling, fishing and helicopter charters, advance reservations for award winning luaus, family portrait photos, star-lit massages, vow renewal ceremonies, golf tee-times and other pleasures to enhance your vacation on Maui.